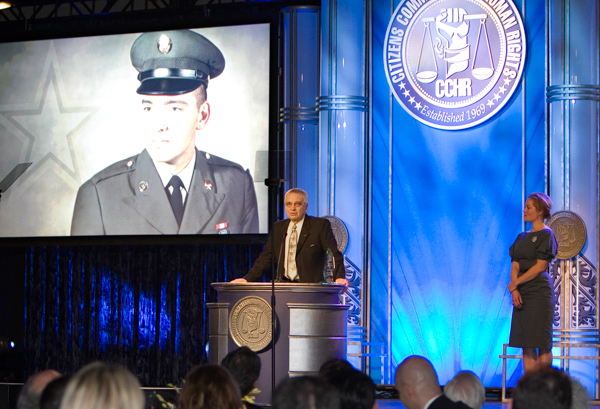 Mental health watchdog, Citizens Commission on Human Rights recently celebrated its 45th Anniversary and Human Rights Awards Banquet in Los Angeles, California, honoring Former Navy SEAL, Mikal Vega and Retired Army Colonel Bart Billings for their fight against the psychiatric drugging of our armed forces. Coinciding with mental health watchdog, Citizens Commission on Human Rights’ (CCHR) release of their documentary, The Hidden Enemy, which reveals in great detail psychiatry’s infiltration of military forces, CCHR honored retired Chief Petty Officer, Navy SEAL, Mikal Vega and retired Army Colonel and psychologist, Bart Billings during its 45th Anniversary and Human Rights Awards Banquet on February 1st, in Los Angeles. In the wake of an epidemic of suicides among military personnel, both Vega and Billings don’t believe that “taking care of their own” ends on the battlefield and are courageously speaking out about the harm caused by the mass drugging of service men and women. Vega and Billings were being honored for their advocacy on behalf of their brothers-in-arms who have experienced psychiatric abuses in the military. Each, in his own way, has gone above and beyond the call of duty, carrying the battlefield mantra of “no man is left behind” to the home front. One in six American service members is on at least one psychiatric drug  Last year, more service members died by suicide than in combat and 22 veterans are killing themselves every day. Vega is referring to the psychiatric drugs he was prescribed as “treatment” upon returning home and the personal battle he faced in withdrawing from such drugs as Adderall and Prozac. Having weaned himself off the numerous and often addictive mind-altering drugs, Vega vowed to help other service personnel going through a similar drug hell. 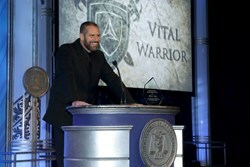 Vega’s personal dedication to helping others is manifested in his launch of a non-profit organization called “Vital Warrior,” set up to help other veterans without the use of stigmatizing psychiatric labels or harmful mind-altering drugs. Together Billings and Vega have shown that there is a better, more humane, way to treat our returning warriors and veterans. About Citizens Commission on Human Rights: CCHR is a non-profit, non-political, non-religious mental health watchdog. Its mission is to eradicate abuses committed under the guise of mental health and enact patient and consumer protections. CCHR has helped to enact more than 150 laws protecting individuals from abusive or coercive mental health practices. “Medicating the Military,” Army Times, armytimes.com/article/20100317/NEWS/3170315/Medicating-military, March 17, 2010. “US military struggling to stop suicide epidemic among war veterans,” The Guardian, theguardian.com/world/2013/feb/01/us-military-suicide-epidemic-veteran, Feb. 1, 2013; “Suicide Data Report, 2012,” Dept. of Veterans Affairs, va.gov/opa/docs/Suicide-Data-Report-2012-final.pdf.